Terry Jicinsky is senior vice president of operations for the Las Vegas Convention and Visitors Authority (LVCVA), overseeing the Las Vegas Convention Center District (LVCCD) expansion and renovation project. The LVCCD is the largest and most important project since the 3.2 millionsquare-foot convention center was built in the 1950s. As the third largest center in North America, the LVCC has helped Las Vegas achieve the No. 1 trade show ranking in North America for 24 consecutive years. With more than 30 years of experience in the travel and tourism industry, Mr. Jicinsky’s career path has covered aspects ranging from consumer travel research, internet marketing, database marketing and hotel management. He previously served as the senior vice president of marketing for the LVCVA, stewarding the world-renowned branding campaign, “What happens Here, Stays Here TM.” Formerly, Mr. Jicinsky oversaw the day-to-day operations of the Las Vegas Convention Center. In his new role, he serves as the direct link between the Authority and the LVCCD owner’s representative. The LVCCD is critical for the continued growth of the meetings and conventions industry in Las Vegas. 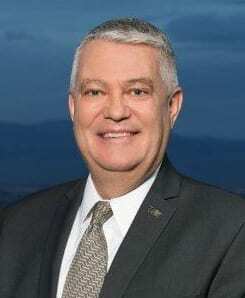 Before joining the LVCVA in 1992, Mr. Jicinsky’s work experience included consulting positions with the national accounting firms Laventhol & Horwath and Coopers & Lybrand, as well as management positions with Marriott Hotels & Resorts. Mr. Jicinsky is a member of the International Association of Conference Centers (IACC), the International Association of Venue Managers (IAVM) and has previously served on the board of directors for the Destination Marketing Association International (DMAI), the International Association of Convention & Visitors Bureaus (IACVB), the International Travel and Tourism Research Association (TTRA) and the American Marketing Association of Las Vegas (AMA). Mr. Jicinsky was named to Hospitality Sales & Marketing Association International’s “Top 25 Most Extraordinary Minds in Sales & Marketing” in 2006. He holds a master’s degree in hospitality administration from the University of Nevada, Las Vegas, and a bachelor’s degree in hotel and restaurant management from the University of Wisconsin, Stout. He is also a certified destination management executive and a graduate of the Las Vegas Chamber of Commerce’s Leadership program. In the last two weeks we learned about the poliovirus and Rotary International’s (“RI”) efforts to eradicate it. We left off last week in 2009. In 2011 RI welcomed celebrities and other major public figures into a new public awareness campaign and ambassador program called “This Close” to ending polio. Program ambassadors included Nobel Peace Prize Laureate Desmond Tutu, violinist Itzhak Perlman, co-founder of the Bill & Melinda Gates Foundation Bill Gates, Grammy Award-winning singers Angelique Kidjo and Ziggy Marley, and environmentalist Dr. Jane Goodall. During 2011 RI’s funding for polio eradication exceeded $1 billion. In 2012 India surpasses 1 year without a recorded case of polio, and is taken off the polio-endemic list. Rotary surpasses its $200 Million Challenge fundraising goal more than 5 months earlier than planned. In 2014, India passed 3 full years without a new case caused by the wild poliovirus, and the World Health Organization certifies the South-East Asia region polio-free. Three countries still have wild polio, Afghanistan, Pakistan and Nigeria. Since 2014 RI has been focused on eliminating polio from these countries and will not stop until we succeed. The eradication of polio is one of our longest standing and most significant efforts. Along with our partners, we have helped immunize more than 2.5 billion children against polio in 122 countries. We have reduced polio cases by 99.9 percent worldwide and we won’t stop until we end the disease for good. As of 16 January 2019 in Pakistan – two cases of wild poliovirus type 1 (WPV1) and five WPV1 positive environmental samples were detected; in Nigeria – we have received advance notification of one case of circulating vaccine derived poliovirus type 2 (cVDPV2) and two circulating VDPV2 positive environmental samples. Wild polio still exists and we need to keep working until we eradicate it. Please donate to the Polio Pig as it makes its rounds through the club this month. At Jim’s head table were PP Michael Gordon, Kirk Alexander, DG John Chase. Becca Roberts wins the Lawry Bucks. District Governor John Chase showed appreciation to Jimmelle Siarot for her participation in our Rotary Programs. Janice Lencke missed the Joker and the Pot but still displays a Smile. Joakim Nyoni presented President Jim with a banner from his homeland in Tanzania. Kirk Alexander was recognized as a Rotarian in Action by the district governor. Our Facebook an Website administrators Kirk and Becca join for lunch. President Elect Jackie Thornhill awards V.R. Kids representative R.J. Sampson with a $1,440 grant. President Jim presented $1,250 Checks to the principals of Bracken, Hollingsworth and Long elementary schools. President Jim presents our “Share What You Can” award to our DG John Chase. Sergeant at Arms Doug Grant handed the mic to Marie Walsh talked about sponsorships needed for Breakfast with Books. Stu Lipoff announced a new way to recruit members. Ted McAdam started the meeting with his invocation.